Mercedes Benz Brake System ABS Control Module operates the ABS system based on data received from its various sensors. It will cost you a lot less to have the ABS module rebuilt with us compared to the cost of repair at the dealer. Therefore the module does not have to be reprograming because the data inside will not need to be Re-Coded. 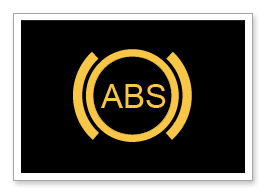 The ABS warning light/anti skid brake light will come on or start flashing when there is a malfunction with the ABS brakes. The ABS control module continuously performs diagnostic self-checks. If it finds a problem, it will shut down the system. There maybe a problem with the wheel speed sensor, ABS Differential Sensor, power relay for the ABS module/pump, or it may indicate a low fluid level in the ABS fluid reservoir. If other lights come on with the ABS brake light, then there could be something seriously wrong with the braking system such as a hydraulic problem or a serious brake fluid and /or pressure loss. If this happens the vehicle may not be safe to drive. The safest thing to do would be to have the vehicle towed. Please call us to schedule a towing . A basic service brake system problem could lead to brake failure which could endanger yourself as well as others on the road. An ABS wheel speed sensor malfunction will signal the ABS light to illuminate and disable the traction and stability control systems. In some cases, the speedometer will stop working and the Check Engine Light will also illuminate. 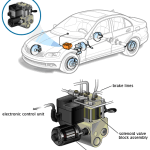 In some Mercedes Benz cars the sensor is an integral part of the hub and therefore the entire hub unit must be replaced. Wheel speed sensors can be damaged when going over rough terrain. There are several other reasons that can affect the ABS system such as: corrosion, worn bearings, or other problems in the ABS system which can set a wheel speed sensor trouble code. The sensor can even get damaged when other work is being performed on your car . Any problem with the ABS system needs to be diagnosed before the wheel speed sensors are replaced. The anti-lock brake system (ABS) differential speed sensor automatically transmits the speed of the differential ring gear to the ABS control module. Using this data, the control module calculates the vehicle speed. 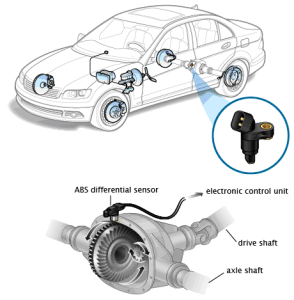 Not all Mercedes-Benz vehicles with ABS have an ABS differential sensor. 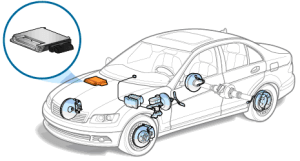 Some vehicles utilize individual wheel sensors instead of a single differential mounted sensor. If this is the problem the ABS light will illuminate on your dash. The anti-lock brake system (ABS) pump provides supplemental brake fluid pressure (in addition to the pressure created when the driver applies the brakes) necessary to operate the ABS system. The ABS pump is the hydraulic valve unit. On most cars the control module can be replaced separately. The ABS light will illuminate if there is a fault with the ABS system. Mercedes Benz Brake System – ABS Control Module are calibrated suspension ride ,steering and overall general handling of your Mercedes. ESC also referred to as electronic stability program (ESP) or dynamic stability control (DSC) all work in together with the ABS Control Module.